INTRODUCE babies to a wide variety of foods in their first year, even allergenic foods, to help prevent allergies developing. 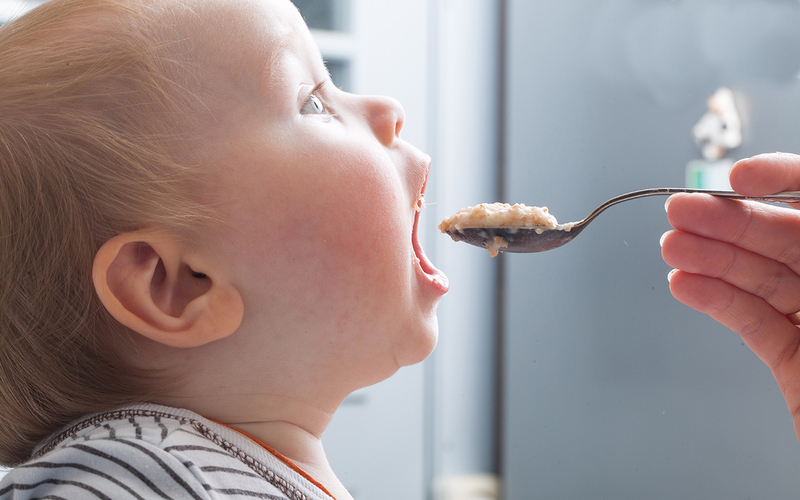 That’s the take-home message experts want parents to absorb from new infant feeding guidelines from the Australasian Society of Clinical Immunology and Allergy, summarised online in the MJA. They provide additional guidance about introducing allergenic foods to infants in light of emerging evidence. They also advise parents not to use a hypoallergenic formula for the primary prevention of allergies. Guidelines for introducing a child to foods have changed remarkably in the past 40 years, the authors wrote. Those parenting in the 1970s and 1980s will remember being told to introduce solid foods when babies were less than 4 months old. In more recent decades, the trend has been to delay the introduction of solids until after 6 months of age. Advice released in 2016 suggested introducing solid foods when the infant was ready, at around 4–6 months. Instead of giving a strict timeline, the new guidelines recommend not delaying the introduction solid foods beyond 12 months, particularly allergenic foods such as peanuts and eggs. With the rise of allergies, it was thought that babies’ bodies were too sensitive for these allergenic foods. However, according to paediatric gastroenterologist and allergist Professor Katie Allen, emerging evidence suggests that delaying allergenic foods is actually harmful. And there are indications that it’s working. In the Learning Early about Peanut Allergy (LEAP) trial, 640 children with a history of severe eczema and/or egg allergy were randomised to consume or avoid eating peanut until 60 months of age. At follow-up, the prevalence of peanut allergy was 13.7% in the avoidance group and 1.9% in the consumption group. More data will come to light at the end of 2019 when additional allergy testing is done on HealthNuts participants. This 10-year study was the world’s first comprehensive population-based study of food allergy and has had vital implications for public health policy. Despite the growing evidence base, introducing allergenic foods such as peanuts and eggs to young children is still a cause of anxiety in parents. There are anecdotes of parents introducing allergenic foods while sitting in the carpark outside hospital emergency or GP practice rooms. According to Dr Wendy Burton, Chair of the Royal Australian College of General Practitioners Antenatal/Postnatal Specific Interests Network, fear and health anxiety is a huge issue in the current environment. Dr Burton said there was a lot of misinformation out there so it was vital that health professionals were armed with the right knowledge. “Allergies need to be placed into context and true allergy separated out from contact reactions or intolerances,” she said. The authors of the new guidelines wrote that it was also hugely important to highlight the statistics. “There have been no reports of fatalities to peanut under 12 months of age anywhere in the world, even in countries that have practised early introduction of peanut (eg, Israel) for many years,” they wrote. Parents should be reassured that children with a family history of allergies are not much more at risk than a family without a history. “They’re more alerted but, biologically, they’re only marginally more at risk,” Professor Allen said. She also highlighted the suggested procedure for introduction of peanut described in the new guidelines. If there is any reaction within the first few minutes of eating a food, parents are advised to stop and visit their doctor for further consultation. The guidelines also highlighted that hydrolysed infant formulas aren’t recommended for allergy prevention. Similarly, “there is no evidence that soy or goat’s milk formula reduces the risk of allergic disease when used in preference to cow’s milk-based formula,” the guidelines stated. Another new recommendation was no probiotics for pregnant women and infants for allergy prevention. Although plenty of studies have been done on probiotics, there has been little conclusive evidence. “As clinicians, we don’t want people to spend money they don’t need to spend when it’s more useful for them to have healthy food in their diet,” Professor Allen agreed. It’s certainly an interesting time in allergy prevention with lots of work being done on the subject. There’s the MisBAIR study, which is examining whether the tuberculosis vaccine could promote immune system development, and the Vitality study, which is looking at the impact of vitamin D on a baby’s first year of life. There are still knowledge gaps, however, such as the optimal timing of introduction of most foods and the quantities required to sustain tolerance. Despite this, researchers are confident the current guidelines are on the right track and similar versions are being adopted around the world. “Introducing a wide variety of foods in the first year of life is the most important factor likely to prevent allergies,” Professor Allen told InSight+.